Now, to add more flavor to this, our filmmakers are choosing the backdrop of their films in a similar style to impress audiences of two Telugu states. In his latest film Sarrainodu, Allu Arjun has appeared as a type of Hyderabad who goes to Konaseema for pelli choopulu and then the story moves to the capital of Telangana. To break that feeling of appearing as a resident of Telangana earlier, it is now said that he is changing his base to Vijayawada. 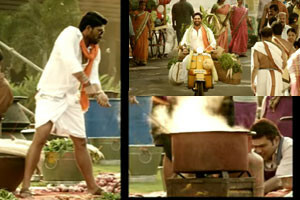 In the upcoming film "DJ Duvvada Jagannadham", he will be seen running a food business with Vijayawada as his base. He will run Annapurna Catering which is located in Satyanarayanapuram Agraharam, Vijayawada. Although this would not have become a case of previous attention since many Telugu movies are made with Vijayawada and Vizag as a base even before we switched from Madras, after the fork the scene has changed. So Bunny is a Vijayawada hero now. Directed by Harish Shankar, DJ Duvvada Jagannadham has Maverick cinematographer Ayanaka Bose capturing images, while Pooja Hegde displayed his glamor.